Established in 2013 between the merger of Random House (owned by Bertelsmann) and Penguin Group (owned by Pearson PLC), with a combined legacy that dates back to 1838, Penguin Random House is a global trade book publisher producing over 15,000 titles annually and employing over 10,000 people. Penguin Random House serves as the corporate parent company for 250 widely recognized and respected publishing divisions, imprints, and brands like the titular Penguin and Random House, as well as others like Alfred A. Knopf, Crown, DK, Fodor’s, and more. This week, the company introduced a new identity designed by Pentagram New York partner Michael Bierut, replacing the interim identity presented with the announcement of the merger in July of last year. 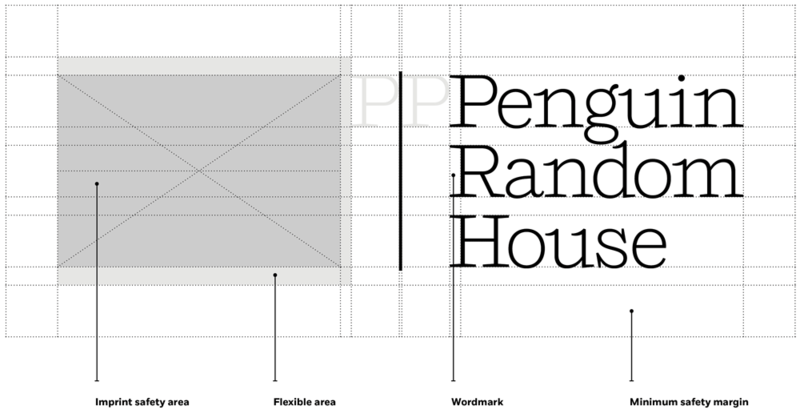 To develop the identity, the team explored many different combinations of penguins and houses — one sketch imagined an igloo — as well as abstract symbols that had nothing to do with either. It eventually became clear that it didn’t make sense to create a new symbol for a company that already has 250 symbols, none of which are going away, and each of which has its own heritage and value. The challenge was to come up with a wordmark that could at once provide a strong endorsement for each of the imprint symbols, and that could in turn gain itself in meaning through association with them. The word mark required a typeface that was neutral enough to work with all the different imprint symbols, yet wasn’t a cold sans serif. Shift has charm and a literary character, along with good legibility at small sizes. In its lighter weights the typeface has the look and feel of a typewriter font — Shift was originally designed by Jeremy Mickel as an heir to Courier — and it provides a connection to the traditional world of writers and writing. 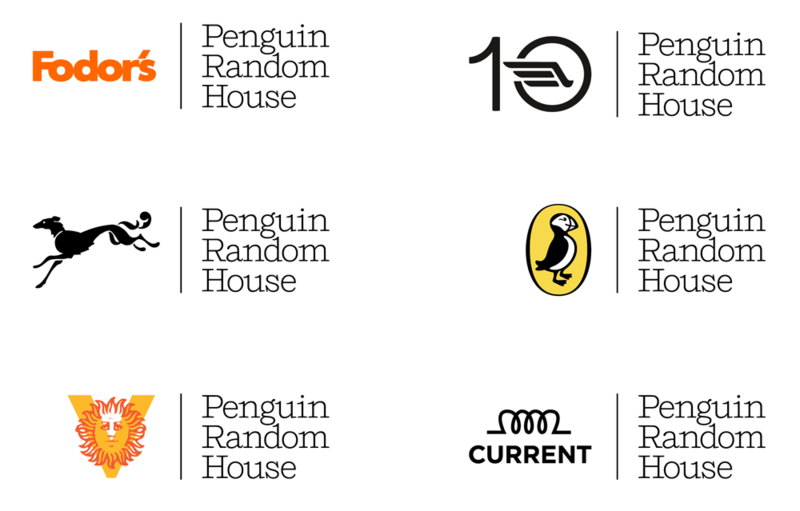 To be perfectly clear from the start: this new logo does not replace either the Penguin penguin or the Random House random house logos. Penguin Random House is what Unilever is to Dove, Procter & Gamble to Tide, or Comcast to NBC. As noted in the quote above, the company’s logo could not compete against 250 other logos through the introduction of a new icon so a wordmark is the perfect solution and rather than rely on the expected Futura (which would have been a crowd-pleasing choice) Pentagram has gone off the beaten path with the selection of the wonderful Shift by Jeremy Mickel. Not only is the new wordmark not a sans serif with rounded corners cut off, it’s a delicate serif with a bookish yet quirky identity of its own, allowing it to take on a leadership role as a standalone corporate wordmark or a supporting role when paired with more visual icons. It’s a lovely choice of type, executed as simply as possible. The identity introduces a new Penguin Random House wordmark that can be used in conjunction with the logo of any one of the 250 imprints, which include leading literary brands such as Alfred A. Knopf, Crown, DK, Fodor’s, Puffin, and more. The logotype may also appear on its own, framed by two rules that “bookend” the mark. (The orange color of the “bookends” is a subtle reference to Penguin’s brand heritage.) Set in the typeface Shift Light, which evokes a typewriter font, the new wordmark underscores the importance of the written word to the company’s culture and work. Co-branding structure for the various imprints. It’s all about the imprints! When paired with any of the 250 individual imprint logos the utility and appropriateness of the new corporate wordmark becomes evident. It works amazingly well with whatever you throw at it — I bet even the sketched igloo would work. Established in 2013 between the merger of Random House (owned by Bertelsmann) and Penguin Group (owned by Pearson PLC), with a combined legacy that dates back to 1838, Penguin Random House is a global trade book publisher producing over 15,000 titles annually and employing over 10,000 people. Penguin Random House serves as the corporate parent company for 250 widely recognized and respected publishing divisions, imprints, and brands like the titular Penguin and Random House, as well as others like Alfred A. Knopf, Crown, DK, Fodor's, and more. This week, the company introduced a new identity designed by Pentagram New York partner Michael Bierut, replacing the interim identity presented with the announcement of the merger in July of last year.